Born in Vietnam, raised in Germany, educated in the United States – Luan Vo Nguyen Quang has known from a young age that his life could lead him to any corner of the globe. He moved from Germany to Texas before completing the IB programme at Awty International School. He is now dedicating his talents to the Friends for International Tuberculosis Relief. After completing the IB diploma at Awty International School, Luan continued on to the University of Pennsylvania’s School of Engineering and Applied Sciences where he completed a major in biomedical engineering. He chose this major “due to its interesting interdisciplinary mix of engineering fields ranging from mechanical and chemical engineering to computer and material sciences.” The credits he earned from the IB diploma could have allowed him to graduate a semester early, but he used this extra time to add a mathematics major to his degree. Luan’s academic achievements led him to a career in pharmaceutical and financial consulting – but seven years into this chapter of his life, he felt that he had yet to seek out his life’s true challenges. He has now focused his life on solving a pressing problem among the world’s poor – namely, the treatment and prevention of tuberculosis by creating sustainable, pragmatic options for the care of TB patients and the control of the disease. He credits two major triggers in shaping his current path. He met and married his wife Tiffany, who shares and helped him discover his passion for social justice. Second, the life of a close cousin weighed heavily on his perspective. Though from the same family and of nearly the same age – his cousin led a much shorter life fraught with difficulty, in part due to disease, drugs, and poverty. He and Tiffany quit their jobs and moved to New Delhi, where they each got involved with social work – she in waste management and he in healthcare. It was there that Luan learned more about the devastating effects of tuberculosis and became determined to stop its advance. They later moved to Vietnam, where Luan and his partners in Germany co-founded Friends for International Tuberculosis Relief. He now works for the organization full-time and 100% pro-bono. 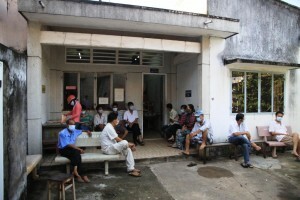 Luan’s work includes meeting with officials at the Vietnamese government’s TB center, visiting affected communities and patients, and completing administrative tasks such as donor reporting, fundraising and communications. Each year, TB claims over 1.4 million lives – almost the entire population of Manhattan – while millions more are infected. The problem is compounded by the social stigma surrounding the disease, as those infected are often reluctant to seek treatment for fear of being ostracized. Because TB mainly affects the marginalized and the poor in developing countries, low commercial opportunity and popular support has limited innovation and urgency to find a solution. Luan cites the lack of funding for research, education, treatment, and innovation for TB control as the biggest challenge he faces. Although Friends for International Tuberculosis Relief is piloting a new TB care and control model which will reach 880 poor patients, it has had trouble attracting the funding it needs. Despite this challenge, he is determined to make the project work. His advice to anyone who wants to follow in his footsteps? Don’t do it alone. Luan’s partners provide support that helps him manage his resources effectively and allows him to balance his work with other priorities. He says that patience is key: although Friends for International Tuberculosis Relief has faced setbacks, he has persisted even when giving up seems tempting. And finally, Luan stresses the importance of ensuring that you’re in a stable position, financially and otherwise, before embarking on a big project or taking a risk as he did. Luan says that his IB experience helped him learn to “cherish different cultures, embrace challenges, and appreciate the fruits of hard labor,” and taught him to push boundaries – traits that he exemplifies through his work today. Another element of the IB that Luan recalls fondly was the camaraderie it fostered among his classmates, many of whom still remain his friends. And although he admits that English was his “weakest class”, Luan remembers his IB English teacher, Dr. Richard Mottram, as an inspirational figure who jump-started his lifelong interest in plays. Luan remains involved with the IB today, most recently organizing a CAS & anthropology trip to Vietnam for the British International School of Jeddah earlier this year. 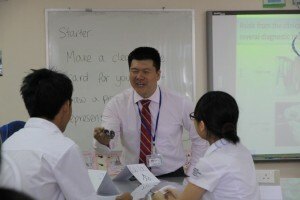 He has also taught guest lectures on TB to 9th graders at the British International School of Ho Chi Minh City. For Luan, the issues surrounding tuberculosis touch close to home and he hopes to dramatically improve access to healthcare and preventive medicine in Vietnam for those who are most in need. Learn more about Friends for International Tuberculosis Relief and please consider supporting this project through Global Giving.